The trademark of approval by APA tells a customer that this product has been manufactured under the strictest programme of quality inspection and testing for a specific use. Only when member mills have successfully passed the APA’s third-party auditing process can they add the official APA trademark – and it can be withdrawn. Each trademark carries vital product usage information as well as indicating the standard to which the product conforms. APAwood-Europe provides an easy to follow guide to these official APA panel notations. In addition, it gives a comprehensive list of relevant European standards and explains how these relate to US voluntary product standards. Engineered wood experts are available to answer your questions about the specification and application of APA products. Ask a question online or call APA on 001 253 620 7400. What are the main changes to the FSC Chain of Custody Certification standard? Download What’s New in FSC revised COC standard. Also, the previous FSC compulsory verification programme has been replaced by a due diligence protocol with a new risk assessment system. Learn more. North American good forestation practice supports the aims of EUTR. Its sustainably managed forests comply with one or more of the five leading certification agencies responsible for verifying proper forestry practices. Can US Underwriters Laboratories certified EPDs be used for environmental performance ratings under the BREEAM system? Learn how APA products can count towards a building’s BREEAM rating. The British Research Establishment and the US Underwriters Laboratories now recognize each other’s certified EPD making it simpler for APA member mills to gain environmental performance ratings under the BRE Environmental Assessment Method (BREEAM). Does APA plywood meet the lowest category (E1) for formaldehyde release without need for further testing? Under the harmonised European Standard for wood-based panels, EN 13986, Annex B, ‘wood-based panels glued with resins emitting either no formaldehyde or negligible amounts of formaldehyde after production as e.g. isocyanate or phenolic glue’ are to be classified as E1 (the lowest formaldehyde release class) without further testing. See APA’s guide Formaldehyde and Engineered Wood Products. APA plywood is designated under the lowest E1 category for formaldehyde release without needing further testing. APA’s US PS 1 and PS 2 plywood have been tested to EN 717-1 and formaldehyde levels already meet the requirements for the E1 classification limit. Also see: Formaldehyde (plywood) and Formaldehyde (OSB). Can APA plywood and OSB be used in non-construction applications? US plywood and OSB are equally effective as sturdy, robust and cost-effective solutions for non-construction applications – from shelving, site hoardings , protective linings in the cargo bay of delivery vehicles to packaging and furniture. See APA’s Performance Panels. Need help to decide what grade or type of panel to use for a specific application? APA’s Industrial Panel Selection Guide (Form T200) is another easy to use resource. How do I equate product Use Classes with the Service Classes given in Eurocode 5 for the design of buildings using engineered wood products? See APA’ s guide to Service Classes and Use Classes. For maximum biological durability, both Service Classes and Use Classes must be considered when specifying US CE-marked panels . This guide helps you make the right selection. ‘Hazard classes’ have been replaced (see updated EN 335:2013) by Use Classes covering plywood and OSB. They will also cover LVL when the LVL standards have completed their current update. Use Classes are based on different environmental exposures that can make the panel susceptible to deterioration. Service Classes, as given in Eurocode 5, are used for assigning strength values and calculating deformation in load bearing situations. They are determined by the moisture content of the panel corresponding to the environmental humidity and temperature during service. How do APA’s member’s products count towards a sustainability assessment for new construction or in refurbishment projects? The British Research Establishment and the US Underwriters Laboratories now recognize each other’s certified EPD making it simpler for APA member mills to gain environmental performance ratings under the BRE Environmental Assessment Method (BREEAM). This is the UK’s leading and most widely used environmental assessment method for buildings and communities. It sets the standard for best practice in sustainable design and has become the de facto measure used to describe a building’s environmental performance. Learn how APA products can count towards a building’s BREEAM rating. What is a ‘life cycle stage’ and how do these link to the environmental assessment of whole buildings? How do core category rules link with environmental product declarations? EN 15804:2012 +A1:2013 provides the core Product Category Rules (PCR) for the production of Environmental Product Declarations (EPD) for all construction products and services. Review with main environmental standards. For more details see: Core Product Category Rules (PCR) for Products and Services. Whose responsibility is it to check that wood products being imported into the EU do not originate from illegally sourced timber supplies? The European Union Timber Regulation (EUTR) puts specific obligations on operators and traders . Operators (or importers) are any (natural or legal) person first placing timber on the EU market. They must maintain records of any traders that they supply timber to. They must implement a due diligence system to minimise the risk of putting illegal timber or any of its derived products on the market. Learn more. Does the EUTR require mills to provide any extra documentation for customs entry into the European Union? The European Union Timber Regulation (EUTR) puts specific obligations on operators and traders and applies to timber originating in the domestic (EU) market, as well as from third (non-EU) countries such as North America. The information it requires has to be retained for at least five years and be available on request. See European Timber Regulation. Must all plywood and OSB panels carry a CE marking? Manufacturers of wood-based products covered by either a harmonised European standard (hEN) or a European Technical Assessment (ETA) must apply for CE marking under the 2013 Construction Products Regulation. See CPR & CE Marking and our Official Guidelines section. What is the definition of a construction product under the CPR? Products must clearly display the CE mark and have the correct Declaration of Performance documentation. For more info: CPR & CE Marking. What is a Declaration of Performance referred to under the Construction Products Regulation? Under the CPR, manufacturers wishing to trade in the European market are legally required to set down the levels of performance for any construction product. They have to be listed in an official document called a Declaration of Performance. What is the difference between Structural 1 and Exposure 1? For Structural 1 plywood, all panels have special improved veneer grades and if manufactured to the American PS1 standard, the veneer grades will be species with a Group 1 strength classification. See group classification of species. The CE-mark on an APA plywood panel means it conforms to European Standards – but which ones? Plywood Design Information looks at the plywood grades A-A, A-B, A-C; B-B, B-C; C-C, C-D and the relevant standards that the trademarked panels comply with. I want to use a Rated Sheathing panel for flooring/ roofing application, what info do I need to know? For plywood, see Span rating. For OSB, see Span rating. A full range of technical information in under Products and Trademarks. What extra strength benefits do Structural 1 OSB panels provide over standard Rated Sheathing panels? OSB Structural I on an APA trademark indicates that the OSB structural-panel meets the requirements of a Performance Rated panel. This delivers superior design capacity for these panels over OSB Rated Sheathing and Sturd-I-Floor. Also see Comparison of Superior Design Capacities for OSB Structural I Sheathing with OSB Rated Sheathing. What is the difference between a touch-sanded panel and sanded panel? Veneer in a finished US trademarked plywood panel must conform to one of the six grades listed in the US PS 1-09 standard: N, the highest classification (rarely produced), followed by A, B, C-plugged, C and D. Non-overlaid APA plywood panels come in three levels of surface finish – sanded, touch-sanded and unsanded. Also see veneer grades for Popular APA Plywood Panels. APA has produced two easy to follow guides to help match the grade numbers given on a US finished plywood panel with the requirements of EN 635-3. Detailed guide listing permissible defects – with maximum sizes. Simplified guide to the US PS 1-09 veneer grading rules and appearance grades in EN 635-3 based on the appearance of the surface veneers. Equivalents cannot be exactly compared as two different sets of grading rules apply. How do I correctly gauge the face appearance a plywood Siding panel? See guide to selecting siding (cladding) with APA 303 siding panels. I want to specify an APA panel for concrete formwork – what do I need to know? See APA’s comprehensive Concrete Forming Design/Construction Guide for architects, engineers and contractors and the types of APA concrete forming plywood panels. Are APA panels tongue and grooved on all four edges? APA panels have a tongue and groove profile on their two long edges. This eliminates the need for support (blocking) under adjacent panel edges to prevent them from deflecting independently of each other when load is applied. See Tongue & Groove (plywood) and Tongue & Groove (OSB). I am not familiar with the term ‘Sized for Spacing’ – what is its significance? ‘Sized for Spacing’ on APA Rated Sheathing, APA Rated Sturd-I-Floor and APA Rated Siding trademarks indicates that the manufacturer has produced the panel to a size slightly less than the traditional nominal 2440mm (96″) by 1220mm (48″). It is done to facilitate proper panel spacing during construction. See Sized for Spacing (plywood) and Sized for Spacing (OSB). For further technical details see Product and Trademarks. How are Performance Category and thickness related? Performance Category, Panel Thickness and Span Ratings are key categories that need to be considered together. See Thickness, Performance Category (plywood) and Thickness, Performance Category (OSB). I’d like to know more about a panel’s Span Rating and how it links to thickness. What is Span Rating on the APA trademark and why is it important? What is the difference between Exposure 1 and Exterior plywood panels? What are their appropriate uses? Bond classification relates to moisture resistance of the glue bond and therefore to the structural integrity of the panel. See glue bond durability classification (plywood) and exposure durability (OSB). What are the main OSB panels likely to be available in Europe? See APA’s guide to panel grades and also info on understanding the trademark. What are the main plywood panels likely to be available in Europe? What are the main European standards that I would need to be aware of for OSB panels? The main standards are: EN 13986 and EN 300. But also see the other relevant standards for OSB. What are the main European standards that I would need to be aware of for plywood panels? The main standards are: EN 13986, EN 636, EN 314, EN 635-3. 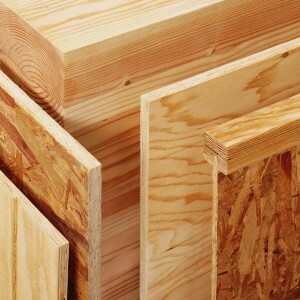 And for more details, see EU standards for plywood.